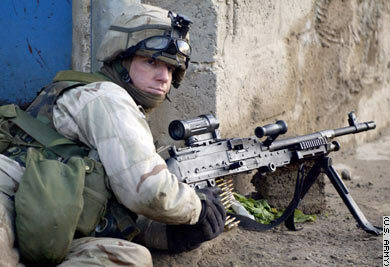 A paratrooper of the 173rd Airborne Brigade maintains a defensive fighting position with his M-249 Squad Automatic Weapon on the streets of Al Hawijah, Iraq, in December 2003. The soldier was participating in Operation Bayonet Lightning, aimed at capturing suspected anti-coalition fighters and illegal weapons. Units: The brigade includes two airborne infantry battalions, one engineer detachment, one reconnaissance company, one field artillery battery and one forward support company. Duties: The brigade parachuted into northern Iraq the night of March 26-27, 2003, to seize the Bashur airfield. Once the Hussein regime fell, the brigade was charged with providing security in the city of Kirkuk. The brigade returned to Italy on March 12, 2004. Nicknamed "Sky Soldiers," the 173rd serves as the U.S. European Command's only conventional airborne rapid-reaction force. 173rd Airborne soldiers fought in World War II and Vietnam but the unit was deactivated in 1972. In June 2000, the brigade was reactivated under U.S. European Command, giving the command the ability to provide an immediate response to crisis situations throughout Europe.